Well, one obvious reason is its location. There aren’t many Byron Bay caravan parks which are located just a stone’s throw from the beach and within sight of semi-tropical rainforest. And then there are all those bushwalks for individuals and families to immerse themselves in or – for more modern tastes – the entertainment parks such as Dreamworld and WhiteWater World. What really makes Broken Head a Byron Bay caravan park that stands out though is its history and excellent relationship with the Arakwal people. 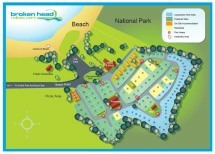 The latter reclaimed the Broken Head Holiday Park in July 2009 this year – thanks to an indigenous land use agreement with the New South Wales Government. Part of the Arakwal tribe’s cultural values is to ensure that the Holiday Park is open to everyone to the extent it is affordable and not in the least bit elitist. The Bundjalung of Byron Bay Aboriginal Corporation (Arakwal), which was set up back in 1996 is focused on bringing about a better life for the Bundjalung of Byron Bay Aboriginal (Arakwal) People, as well as improving its land and waters. The corporation itself was formed under the Corporations (Aboriginal and Torres Strait Islander) Act 2006. It includes a Board of Management with nine members and three full time staff. They all meet twice a month and at an annual general meeting or specially called meetings on particular topics. The members on this board also attend other relevant meetings with groups important to maintaining the culture of Byron Bay such as the Australian Institutue for the Conservation of Cultural Material and Byron Shire Council. Who are the Arakwal people in Byron Bay? Known as the Bundjalung of Byron Bay, the Arakwal Bumberlin people, have been resident in the Byron Bay area for an astonishing 22,000 years. They are one of more than 500 Aboriginal tribes who lived on the island of Australia prior to the arrival of Captain James Cook and other Europeans over the centuries. Arakwal Country in Byron Bay stretches from Seven Mile Beach (which sits to the south of Broken Head) all the way northwards to the Brunswick River, to the escarpment in the west and eastwards towards the Tasman Sea. Byron Bay (known as Cavenbah in Aboriginal tongue) is a gathering point for various clans of the Bundjalung nation. Geographically it extends southwards as far as the Clarence River, past the Tweed River to the Nerang River in southern Queensland, and westwards to the Great Dividing Range. According to Arakwal legend at Byron Bay the spirits of wounded warriors lie within the mountains only to be awakened by a thunderstorm which is the noise of the bloody battles fought by the warriors thousands of years ago. The mountain of Wollumbin is said to be where the chief warrior resides and, from a certain angle on the north sound of the mountain, his face can be occasionally be made out in the rock formation. Always a fascinating subject, the Aborigines used primarily herbs to cure their sick. Inhaling steam was one method of taking this medicine while others were ingesting crushed herbs or sleeping with the herbs inside a pillow. Herb tea was a common treatment and so too was bathing in water in which leaves or bark had been crushed and immersed. Ointment came in the form of animal fat mixed together with crushed herbs while another prescription was for a form of gummy paste to be poured over the patient. Tribal doctors however, weren’t just expert in topical medicine – they also required a spiritual side which could involve them visiting the sky and fighting with serpents. A ritual they performed was believed to have the magic effect of curing serious illnesses. This is because the Aboriginal people were of the opinion that very serious illness and even death were the result of spirits getting up to all sorts of witchcraft. These spirits could also be mischievous by causing a tribal member to fall out a tree or be bitten by a snake. You can learn more about the Arakwal people and their beliefs when you visit our Byron Bay caravan park at Broken Head. We’re happy to answer any questions you may have!